Tua-i tamarmeng cat elpengqertut. Taringumaluku yuullruluteng augkut. All things certainly have awareness and sense. Our ancestors understood that very well. The Yukon-Kuskokwim delta is rich in resources--for those who knew how to use them. Beginning in spring men and women were constantly working to harvest what the land and sea provided. Driftwood, slate, ivory, bone, fish skin, seal gut--these were just some of the materials Yup'ik people learned to use and value. 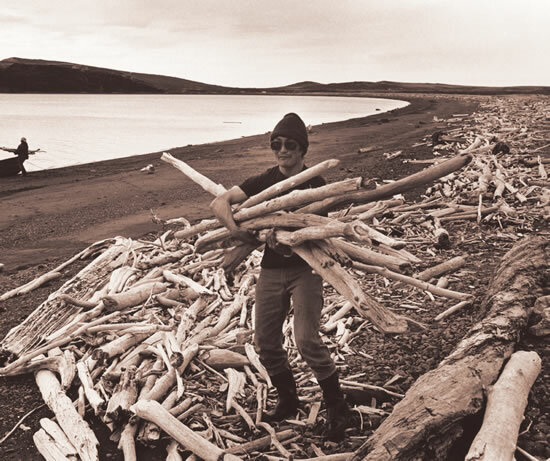 Mona and George Washington gather wood near Stebbins, 1982. Theresa Moses recalled: "They say that when something is available, you have to collect it before snow covers it. For us girls it was grass, and for young boys, it was wood." Cailkami-gguq pektaqamta, muragaq, inangqalngullra neq'akluku, kiitengnaqluku waten pek'arcitengnaqluku pitukilta. Mumigartaqami-gguq quyatuuq muragaq. Tavaten tua-i pillrat piluku tamakut tamaa-i niitellrenka aturluki, "Kia kinquvet alekluten piksugluten piyuaraaten." Tavaten qaniqeraqluki. Tavaten lingrayutuut-gguq, quyaluku-ll' tauna pistelteng qacullerkaanun lucky-llerkaanun-llu cingqeraqaat. When we roam on land, remembering that driftwood was tired of lying on one side, we were told to always pull it from the ground and let it dry. They say when driftwood was turned over, it would be grateful. So, remembering what I was told, I'd say, "When you dry, someone might want you." You'd say this to the driftwood when you turned it over. They say it would be very grateful for being turned over and push the person toward the time he will be lucky.